Several familiar faces will return for this year's Newburgh Christmas Concert, which will be held Saturday. File photo. Mae Whalen couldn’t help but reflect back on the years as she sat down to write the script for the 39th annual Newburgh Community Concert, which hits the stage this Saturday with 3 p.m. and 7 p.m. show times. 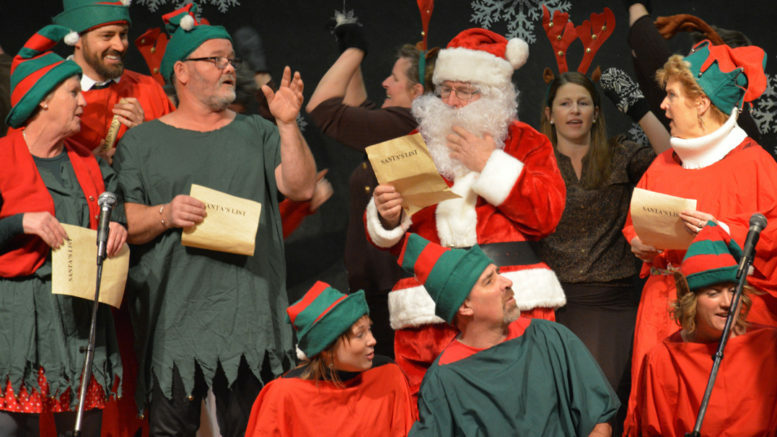 Once again taking place at Newburgh Public School, the show has become a holiday tradition in the village as the amateur cast gets a chance to showcase their comedic skills and singing voices. Whalen, who returns to direct the always highly anticipated variety show, is one of a handful of members who has had a hand in all previous 38 productions. She couldn’t help but chuckle as she remembered searching out Christmas albums and then later CDs for writing inspiration to now being in 2018 and writing a skit about emojis. Whalen says they’ve always prided themselves on featuring something for all ages and this year will be no different. While some people may wonder what an emoji is, they’ll almost certainly relate to the cast’s comedic take on the classic game show Family Feud. Only in this case, it’s Bethlehem Feud. “Most of the usual suspects are back, we have a cast of about 18,” said Whalen. Once again three generations will be represented on stage as original cast members share scenes with their now adult children and their grandchildren. Some of the ‘second generation’ actors weren’t even born when the show debuted. The show is sure to be filled with laughs as they poke fun at some of the biggest news events of the year, as well as putting their own twist on some of the biggest hit songs of 2018. “It’s a mix and mingle of all sorts of different things and that’s part of the charm of it,” said Whalen. Admission to the show is by donation and just like they always have done, the cast will take the money raised Saturday to go shopping for toys on Sunday. Those gifts will then be given to less fortunate children in the area. Newburgh Public School is located at 19 East St in Newburgh. Audiences attending the 3 p.m. show are encouraged to arrive early as the gym fills up quickly.